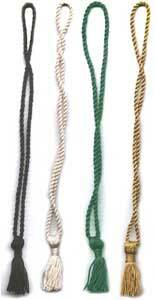 Buy Cord and Tassel - TasselnFringe.com as low as $0.16 @ our store ,shipment in two days . . ! Buy Cord and Tassel as low as $0.16 @ our store . . ! 17" Metallic Gold & Silver Cord. 24" Metallic Gold &Silver Cord. 30" Metallic Gold & Silver Cord. Chainnete Bookmark tassels with 2.5" Tassel and 10" long loop. Can be made in you required size and color. Rayon Floss Bookmark tassels with 2.5" Tassel and 10" long loop. Can be made in you required size and color. 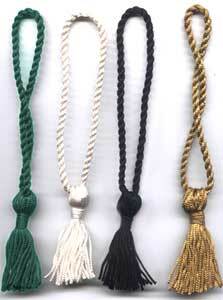 Chainnete Bookmark tassels with 2.5" Tassel and 4" long loop. Can be made in you required size and color. 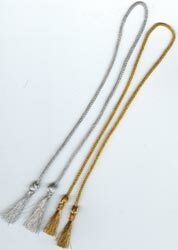 Metallic Gold & Silver Bookmark tassels with 2.5" Tassel and 4" long loop. Can be made in you required size and color.